AUD/USD stays above a bullish trend line on the 4-hour chart and remains in the uptrend from 0.7075. As long as the trend line support holds, the fall from 07295 could be treated as consolidation for the uptrend, and another rise towards 0.7350 is still possible after the consolidation. 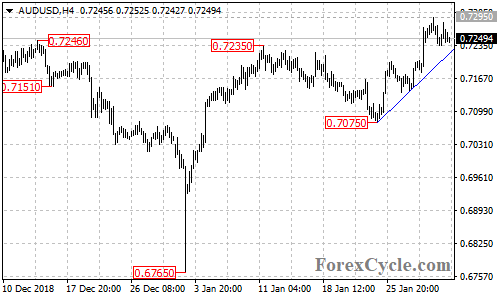 On the downside, a breakdown below the trend line support would suggest that the uptrend had completed at 0.7295 already, then next target would be at 0.7170, followed by 0.7100.